In our childhood, fall meant a choice of pumpkin pie or pumpkin pie. Today, there’s pumpkin everything. Walk into your favorite food store: You’ll find pumpkin-themed products in every aisle. Start the day with pumpkin yogurt or a bowl of pumpkin granola, toasted Thomas’ Pumpkin Spice English Muffins and bagels. Wash them down with pumpkin coffee or tea. End the day with pumpkin ice cream. And pumpkin-up everything in-between. And we haven’t even gotten to the baked goods, from bagels and scones to pumpkin cheesecake. Some contain actual pumpkin or closely-related squash; others are simply accented with pumpkin pie spices. Yesterday we covered pumpkin beer. Here are some of our favorite products of the season. Many are limited editions, so don’t dally! David’s Tea Pumpkin Chai, a black spiced tea, is a customer favorite. It’s fragrant and flavorful, with notes of cardamon, cinnamon, cloves and squash pieces, and a hint of caramel. David’s recommends stirring in a spoonful of brown sugar and topping it with steamed milk. We drank ours straight. It’s also available packed in a tin for gift-giving; and herbal Spiced Pumpkin Tea. Take a sip at DavidsTea.com. You can find Celestial Seasoning’s Sweet Harvest Pumpkin Black Tea at many supermarkets. You’ll find everything from caramel, maple and nutty flavors like almond and hazelnut, along with the fall spice flavors: cinnamon, gingerbread, pumpkin spice, snickerdoodle, etc. Looking for K-Cups? You’ll find plenty of them. We’ve been working our way through Dunkin Donuts Pumpkin Spice at a brisk pace. If you can’t find them locally, head to DunkinAtHome.com. 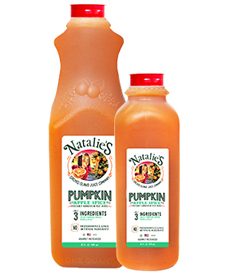 Natalie’s, our favorite line of all-natural, fresh-squeezed juices, squeezes apples, pears and real pumpkin, blended with cinnamon, ginger and clove. It’s very special. If you can’t find it locally, contact OrchidIslandJuice.com. Pumpkin yogurt abounds, with a shout-out to Noosa Pumpkin Yoghurt, one of our favorites. Stonyfield Organic has Pumpkin Oh My Yog, a tri-layer whole milk yogurt: cream top, honey-infused whole milk yogurt middle, and pumpkin bottom. 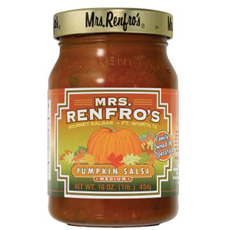 Mrs. Renfro’s Pumpkin Salsa is a smooth (as opposed to chunky) salsa that is delicious on anything, starting with a sauce for chicken, fish, tofu, grains, potatoes and other vegetables. For the classic American use—with chips—there are seasonal offerings such Food Should Taste Good’s Fall Harvest Chips, Way Better Snacks Punkin’ Cranberry (yes, that’s how they spell it) and other brands. We even added it to vodka for an instant Pumpkin Martini. MORE PUMPKIN PRODUCTS TO COME! 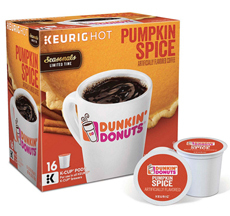 Pumpkin Spice coffee from Dunkin Donuts Home. Mrs. Renfro’s Pumpkin Salsa. Pumpkin Apple Spice Juice from Natalie’s. 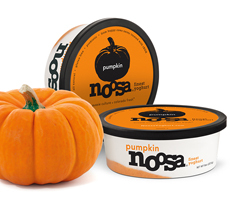 Noosa Pumpkin Yogurt. 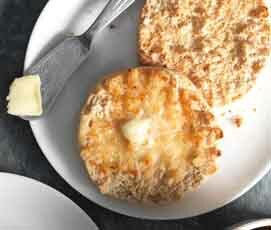 Thomas Pumpkin English Muffins.